In Washington, DC, so known for its adaptive reuse real estate projects, Mather Studios stands out. 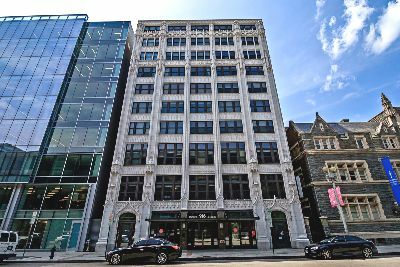 Located in vibrant Chinatown (although some will say it’s in the Penn Quarter), this historic 1917 office building with its Gothic Revival influences, has been transformed into 50 luxury loft condos for sale. But that’s not all—the 10-story structure is also home to 12 affordable-rate artist studios as well as a dance studio, a theatre, an art gallery and creative arts office space. This all came to pass when developer P.N. Hoffman recognized a need not only for upscale living but for affordable options for the local arts community, especially in light of rising real market rates that have driven many creative types out of the Downtown DC area. The project was completed in 2004 and is now home to a fascinating cross-section of condo residents, artists and other creative types. That includes office space for the Cultural Development Corporation (CuDC) which was formed by the Downtown Arts Association to foster growth in the city for painters, dancers, stage actors and more. By this point, the image of Mather Studios as an uber-hip creative community should be evident. So let’s turn to the 50 luxury residential condos which come in a variety of floorplans, from 700 to more than 1,100 square feet. You’ll find these authentic lofts at 916 G Street, NW, between 9th and 10th Streets. While most of the units are one-bedroom true lofts, many also have an additional den which can be used for extra sleeping space. With polished concrete floors, huge windows, exposed brick walls plus ducts and structural support beans, sliding frosted-glass doors, overhead duct work and soaring ceilings, these minimalist modern creations bespeak industrial chic. Add to that, super cool kitchens with granite counters and stainless steel appliances. Also worth noting are the extremely spacious penthouse units with private rooftop decks and sweeping views of the city skyline, including the Washington Monument and National Mall. Common amenities for this pet-friendly building include parking, bicycle storage and an amazing modern lobby with granite floors, original artwork, staffed front desk and concierge service. And don’t forget the gallery, the theatre performances and all the other great stuff that’s happening on the lower floors. And when you decide to venture outside, you’ll find yourself in the beating heart of Chinatown with amazing food, sights and sounds. Plus, the Verizon Center, the Smithsonian, the National Mall, and the Chinatown Metro and Gallery Place Metro are all within easy strolling distance. For more information about Mather Studios lofts for sale, call District Partners Real Estate at 202-798-3600.